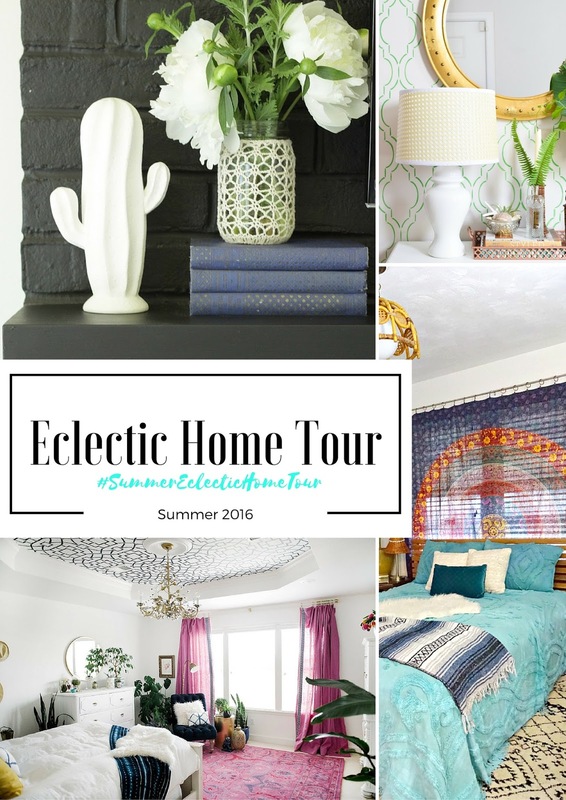 In my years of blogging, I have met lots of friends and lots of talented designers, but this week some of my kindred peeps are sharing their eclectic summer home tours! This group of gals all have a gift for pattern mixing and color and plain ol’ creativity… Tune in all week to see how everyone gets their fun homes ready for the season! 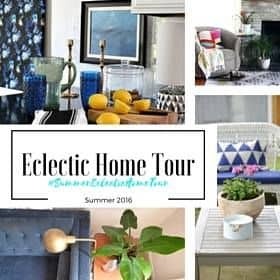 I’m going to be up front and go on record that mine isn’t so much a spring ‘home tour’ as it is a reveal of a few spring related projects around here! Believe it or not, I’m not actually one to decorate the house from season to season… Halloween, sher. Christmas, definitely… but spring usually means sprucing up the OUTDOOR spaces and not so much the interior. 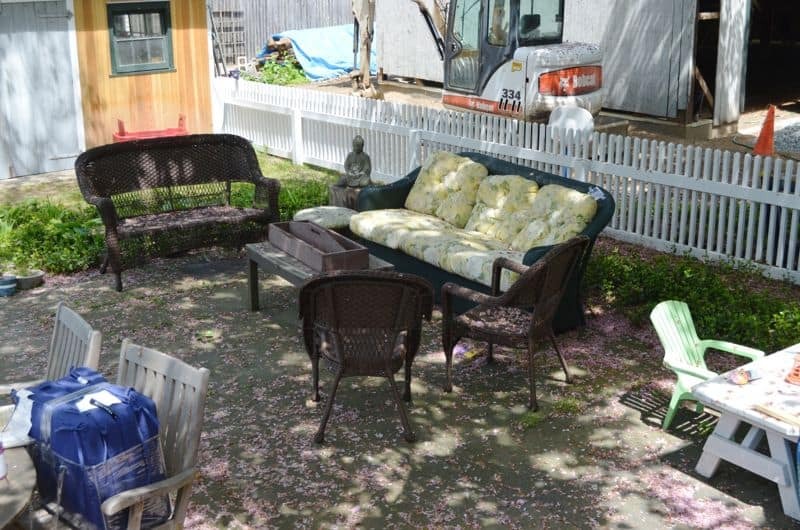 The thought of putting together a full house tour a few weeks after the One Room Challenge and a few weeks after my trip to L.A. was not appealing UNTIL… I got my hyperactive brain onto the challenge of pulling together our back patio. Which looked like this. Ugh. 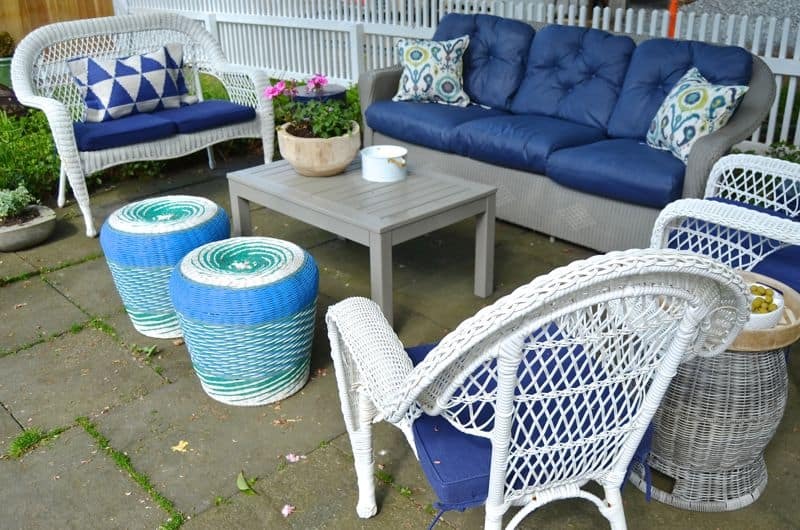 The space started with a set of teak furniture, another set of all-weather wicker dining chairs, and finally, a third set of all-weather seating. Again… all Craigslist, all different. My goal aside from the aesthetic of ‘pulling together’ was to bring in a better seating area. 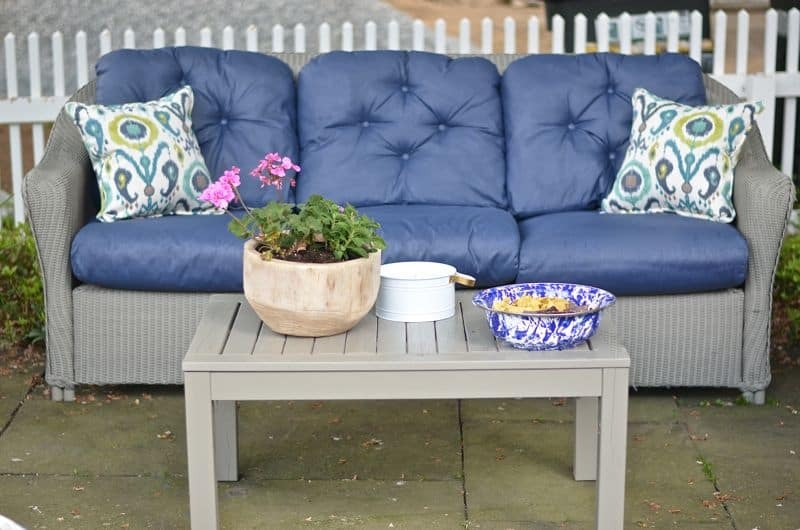 A reader tipped me off to a relocated consignment store that had some outdoor furniture listed and… ta da… this simple 3-seat couch was for sale. Wicker isn’t meant to sit outside, but… I gave this a few coats of exterior paint and will bring it inside when summer is over. The original couch had dated yellow floral cushions. I was all set to pitch them and grab new ones at Homegoods, but then… I realized they were in GREAT shape and… latex paint and fabric medium is under $40. Here’s the thing with painting cushions. It gets WAAAAY worse before it gets better. Just know this and repeat your calming Zen mantra. I’ll share a tutorial for these next week! Last weekend at the flea market I found almost the identical loveseat and chairs as the brown ones we already had. It’s NOTHING fancy, but I thought the white might be a nice swap since the brown doesn’t quite work with either of the other furniture out there. What do you think? Team white wicker or team brown wicker? 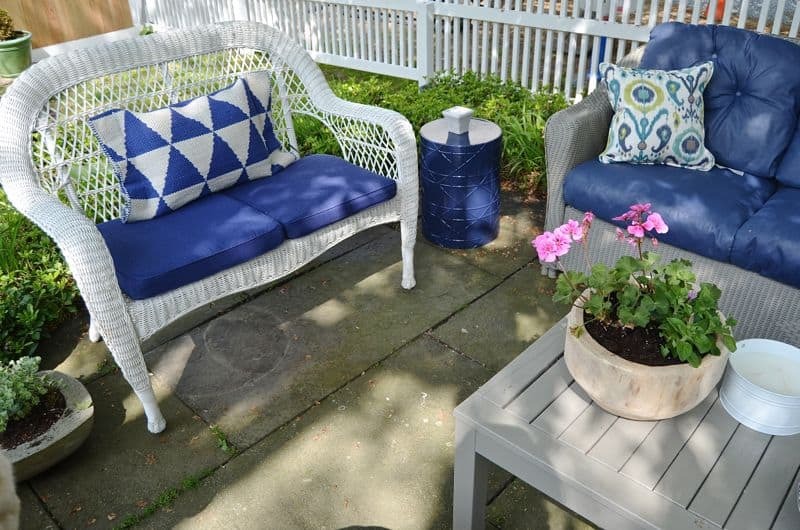 What patio would be complete without plantings. 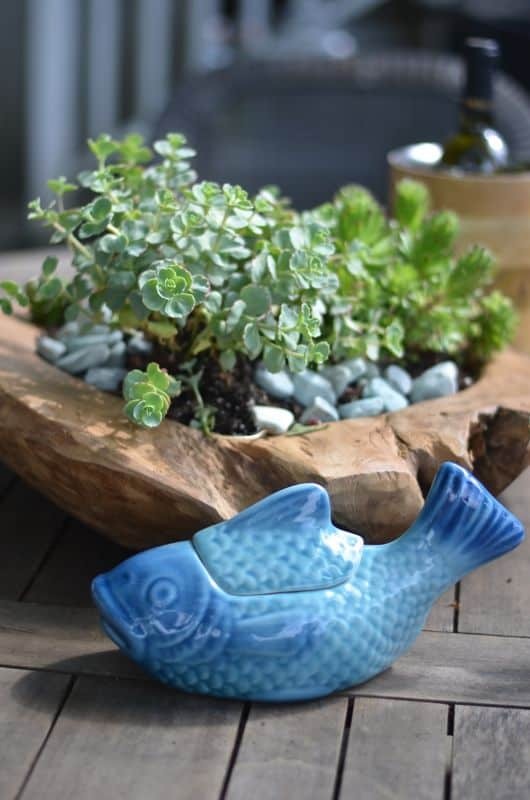 The blue planters are from Homegoods and help with ‘operation coordination.’ I love the bright blue juxtaposed with the lovely green leaves. 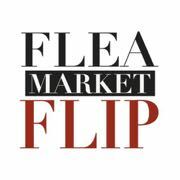 Oh, and Buddha is a flea market score too. Love him. 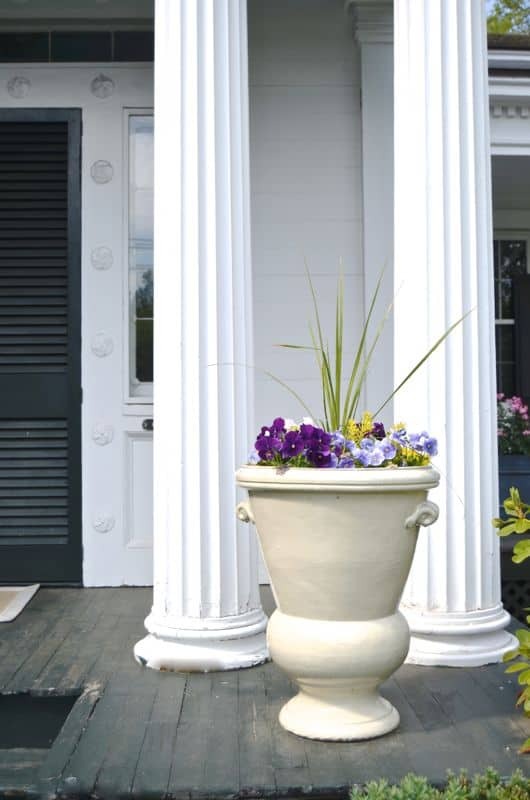 I made those concrete planters AGES ago and they’re still some of my favorite things to freshen up each spring. I stick with the basics: succulents and geranium. That wicker elephant leapt into my cart at Goodwill. The weekend before, I’d been tempted by the exact same one at the flea market but I passed… the universe needed that elephant on my patio I guess! How cute is that pillow? It’s a throw rug that was on clearance at TJMaxx. I sewed it into a pouch and stuffed it with an outdoor cushion. While I was painting the couch, I also painted the coffee table… It’s still a little rickety, but it doesn’t look NEARLY as old and weathered. 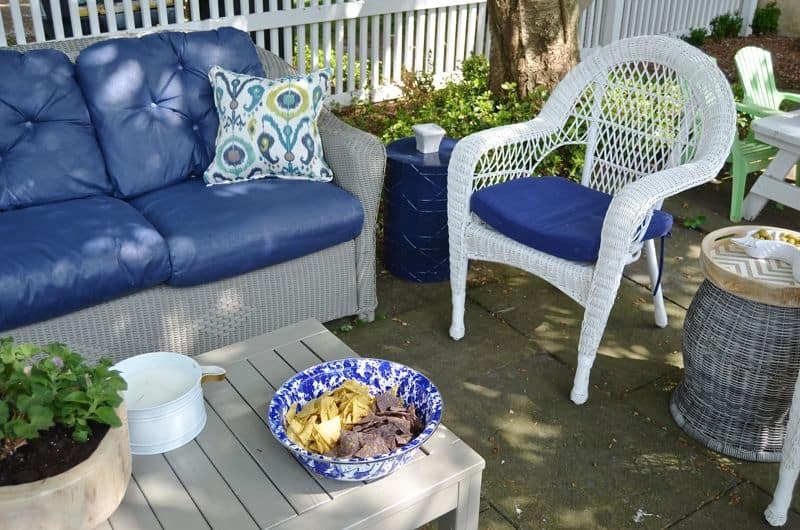 The white patio set came with a side table… I didn’t need it for the main seating area, but it’s been perfect next to the grill to hold drinks, extra plates and napkins and a bottle opener. The planter on the dining table was from Homegoods and I filled it with succulents… They’ve already grown a few inches so I’ll need to learn how to trim it all back STAT. The corner table used to be green, but I sprayed it a navy to match the cushions. 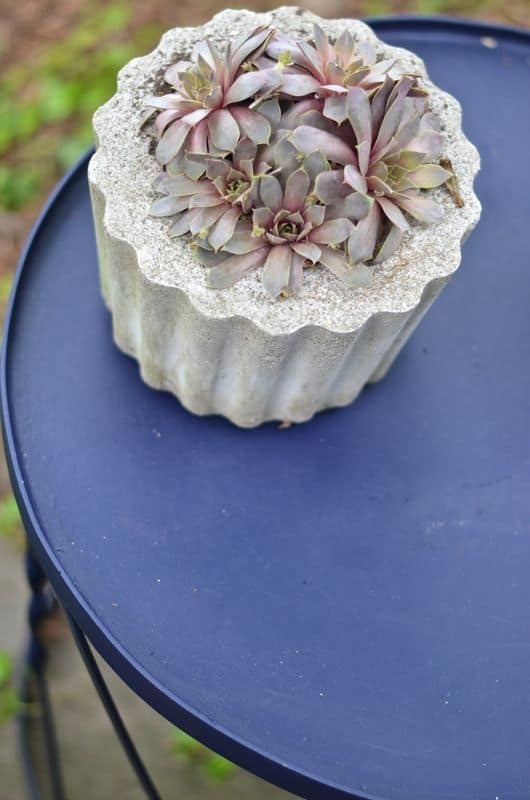 Another concrete planter to make me happy. Moving over to the main seating area, that side table between the white chairs is actually a basket I flipped over and found a tray topper for. 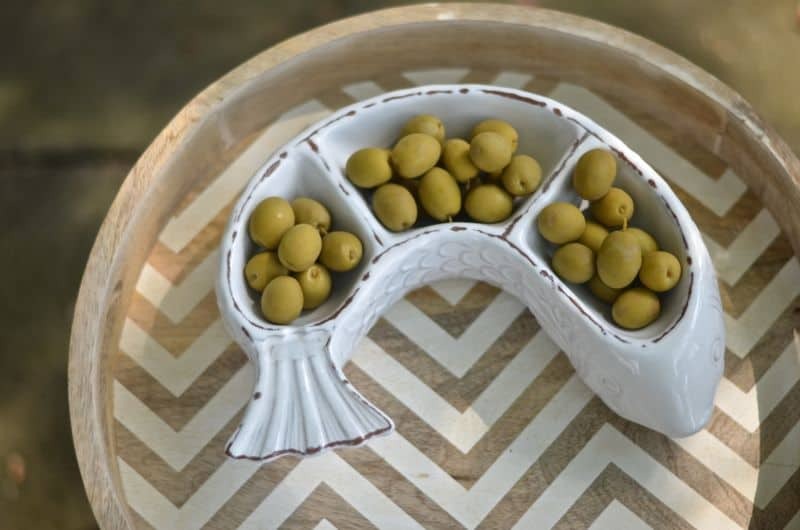 I bring the tray in out of the weather, but it’s great for serving simple snacks and holding a few cocktails. The kids have their own little picnic table and love to gather around it for a meal. 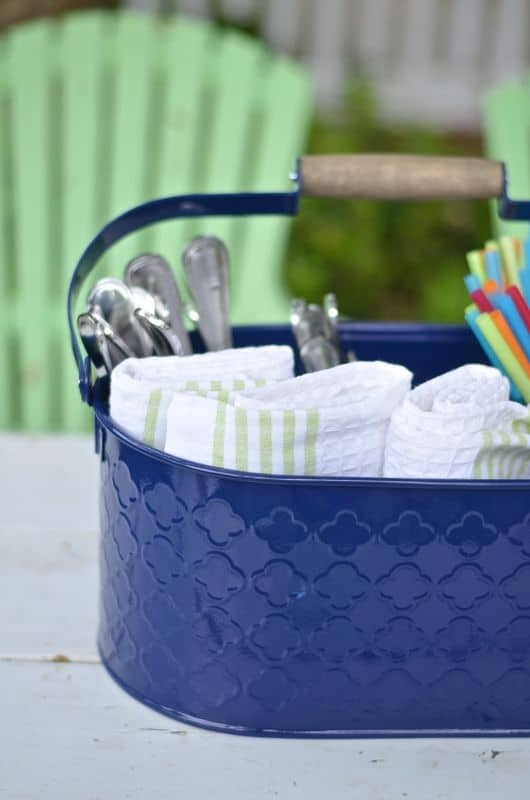 That navy silverware caddy is great to wrangle their forks and spoons and straws and such. I’ve got to be honest, I struggled to capture this space. The construction in the background combined with a shedding tree above make the picures seem a little disheveled. I made this video to give you the live view… if I didn’t cover everything, take a look at the video since I might mention it there! Now… head on over to the rest of the talented ladies in today’s eclectic summer tour, and tune in all week for lots of others! Psst… Like the looks of this? 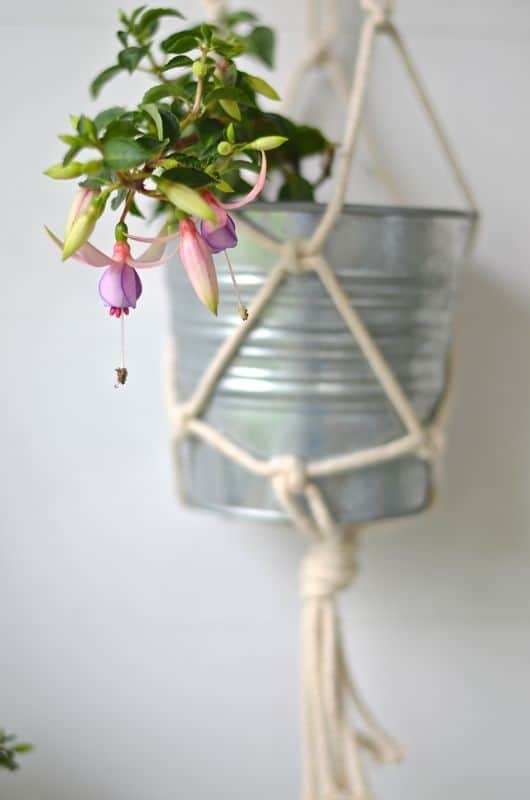 See how I made this fun hanging garden on Thursday! And tune in tomorrow for our next edition of the DIY Houswives! Woohoo… great week over here!! Charlotte, I love it all! That pillow, that elephant… I’m so glad you ended up with that adorable elephant! 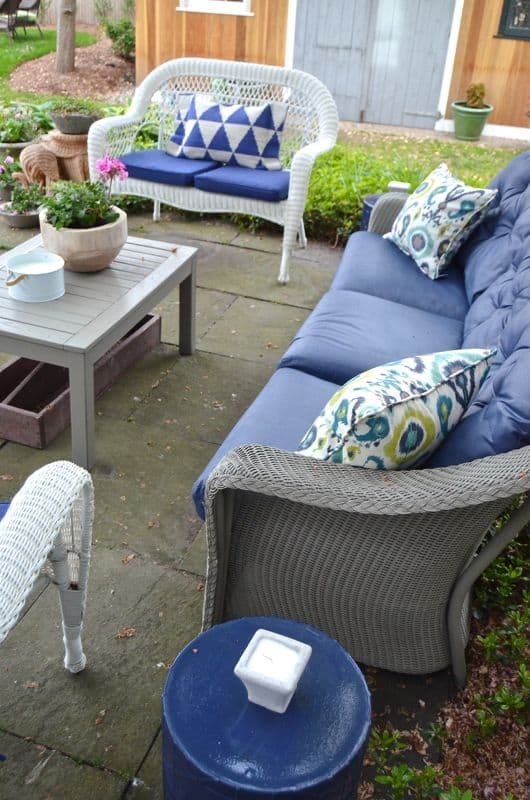 Several years ago I painted some worn outdoor cushions and they are still holding up after years in the elements. I’m always amazed by the power of paint. Did I mention I love that elephant? I know! 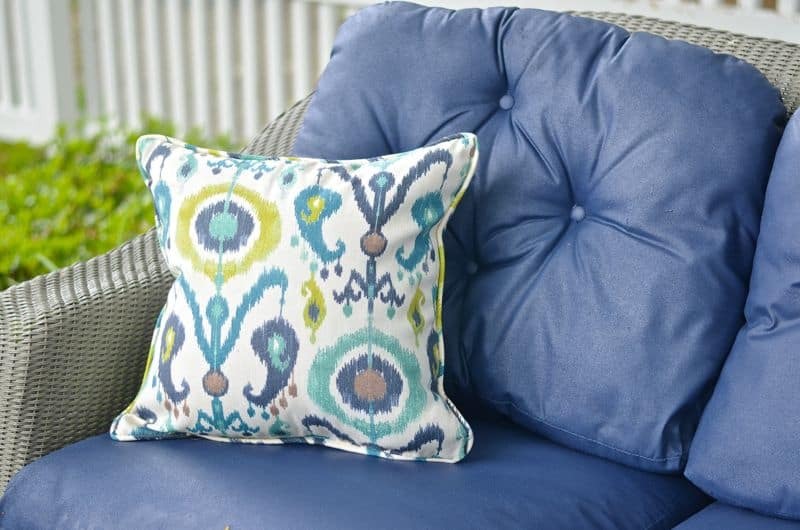 And these don’t feel ANY different than regular outdoor cushions. 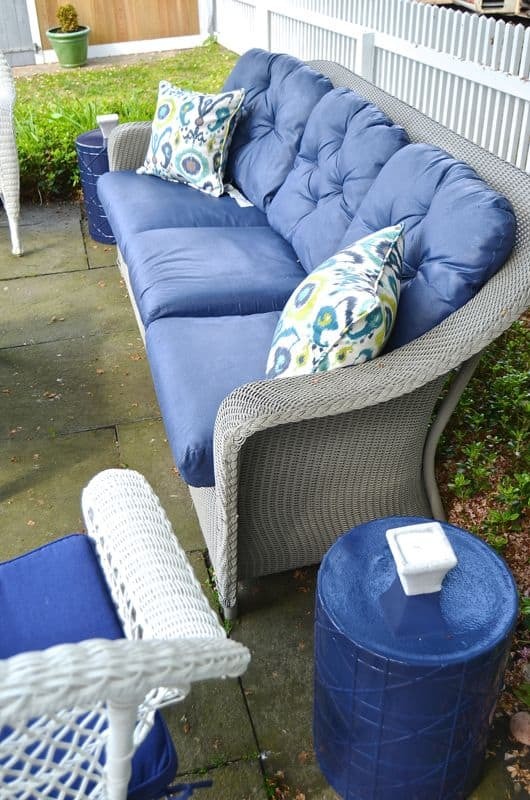 SO glad I took the time… outdoor cushions can cost a fortune! Glad to hear yours have held up. And I’m delighted about the elephant… I’m sure it’s not great to just have it outside, but that’s the beauty of something that cost $10! I am going to have to go team white on the wicker. 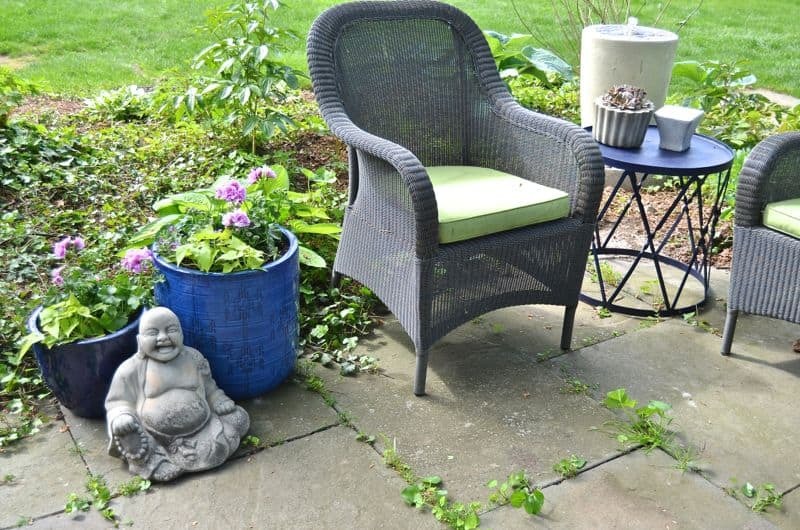 I have a very dark brown set (like yours) of the resin wicker that I am considering painting a lighter color. The brown just doesn’t look as fresh and Summery. 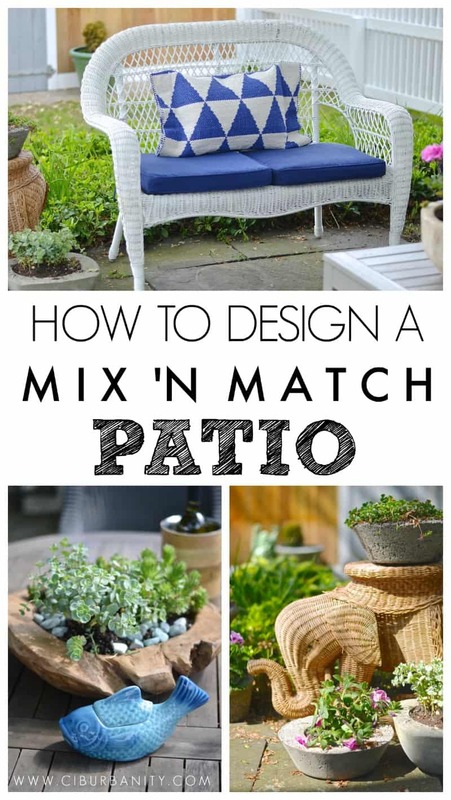 Your patio tour might be just the kick in the pants I needed to finally get it done. It’s SO much better. I was worried it would jump out as being too bright, but it’s just the right amount of brightness and it makes everything else seem that much brighter. It’s not perfect, but… SO much better than before. Until the $10K… this will have to do. 😉 Ha! Operation Coordination was a big success! I love all the blues you used to tie it all together! It’s better than nothing, right?! Thanks! Until the whole patio gets a face lift this works juuuuuust fine! Absolutely lovely! You did an amazing job! Congrats! THanks! For a little elbow grease and a little money, it’s a pretty good result! I love all the extra seating, so that alone is a win-win! HAHA! Fair enough. I’ll consider myself warned. Thanks!! 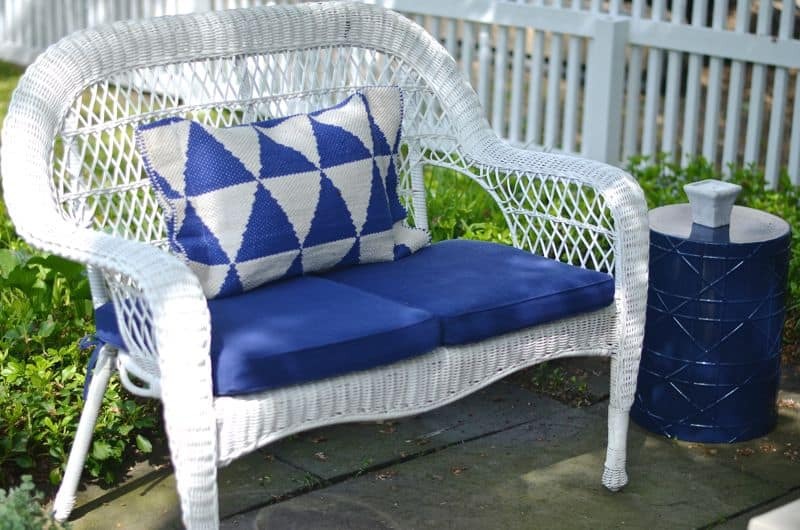 I think it looks great and I love the white wicker – although I have brown myself. I’m looking forward to the tutorial on painting the cushions, too! Thanks! The browns were all so close in color that they were clashing a little. The white breaks up the earth tones! Blue is the color of this season! 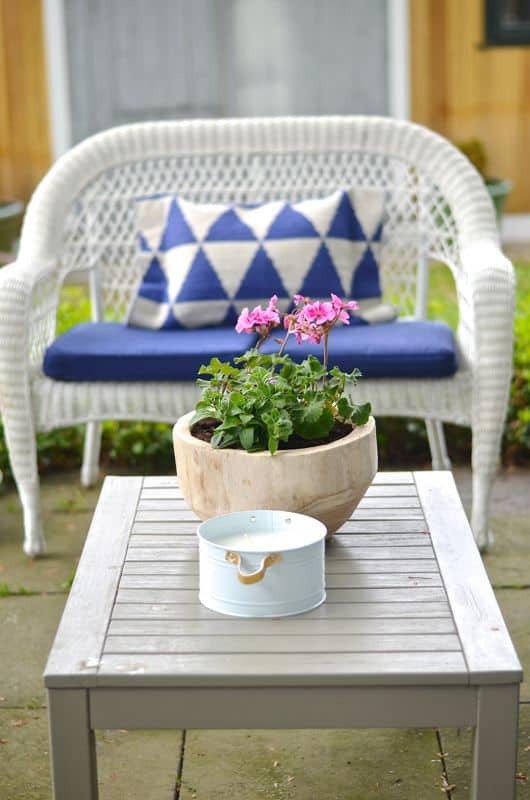 I love all your mix matched pieces and those concrete planters were one of my favorite DIYs of yours (you have so many great projects but I remember those planters bc that is when I first found Ciburbanity–no turning back) love it Charlotte! you are singing my song with your colors, charlotte! i LOVE it! so pretty and what a difference! I adore your space and I love how it’s totally collected over time. 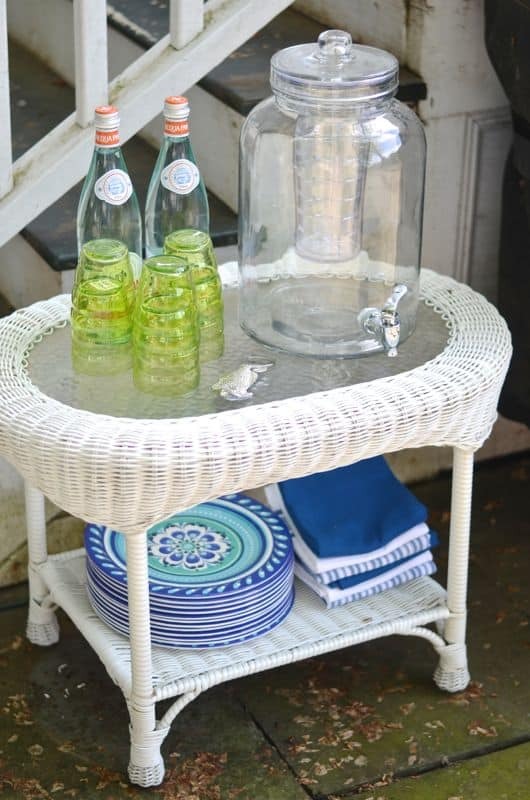 I have thrifted furniture as well outside and with a bit of love it looks pretty cute. I adore your rug turned pillow and concrete planters. Awesome job! I love everything. Nice talented ideas. What?! You have buddha’s too?! LOL For real though, I CANNOT believe those cushions are painted!!! You should see my face up in my computer screen looking at your photos. I kept going back to look at the before pictures 🙂 I will definitely be blog stalking you until you post that tutorial on how you did it. Great job!! This is fab! 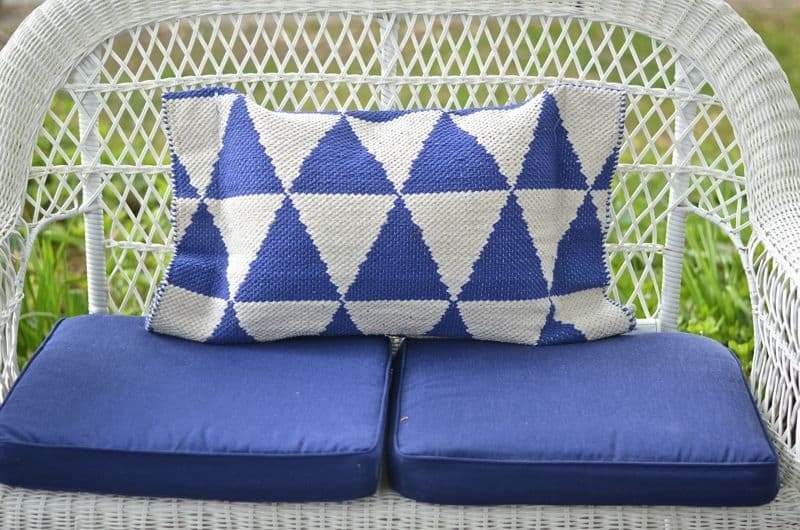 Big win on the white wicker, and I love all the blues, too! 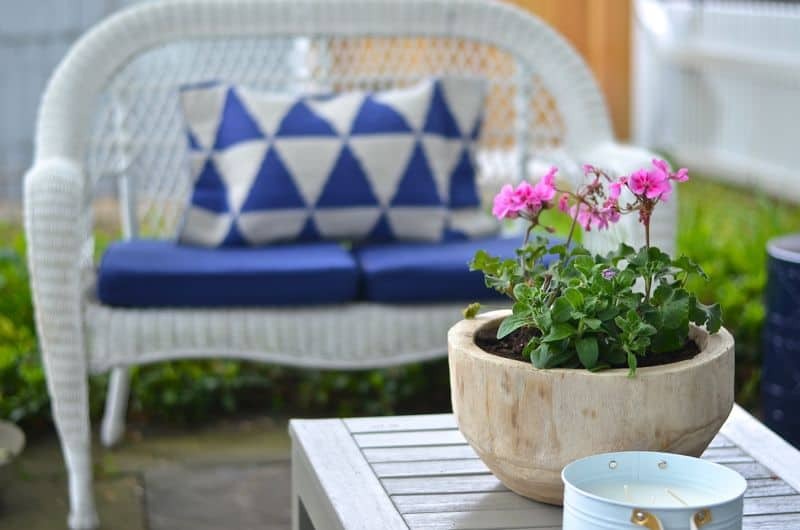 Love your patio and all the fun color! Really love the throw pillows and tables. Can’t wait to see your tutorial on painting fabric. Enjoy your fun patio! Such a great transformation! That patio looks so bright and inviting. 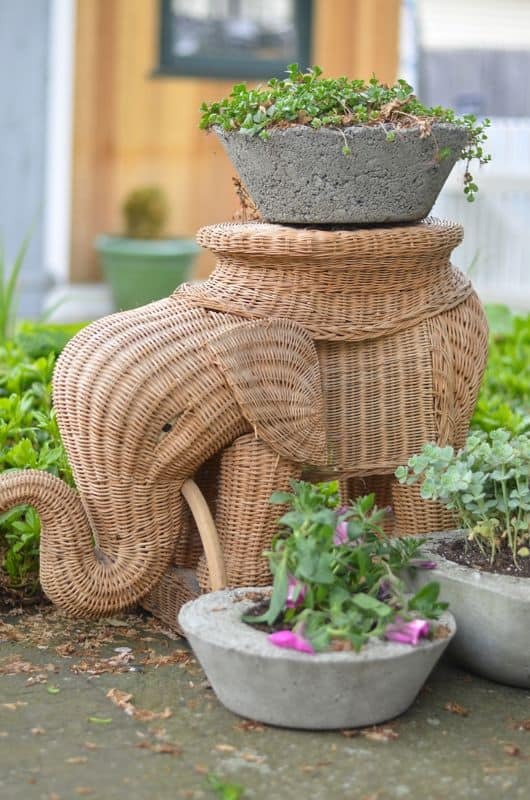 I’ve got a twin elephant in our patio, also a thrift find, although mine looks a bit more… thrifted than yours. It looks great! Love it. I love all of the blue! 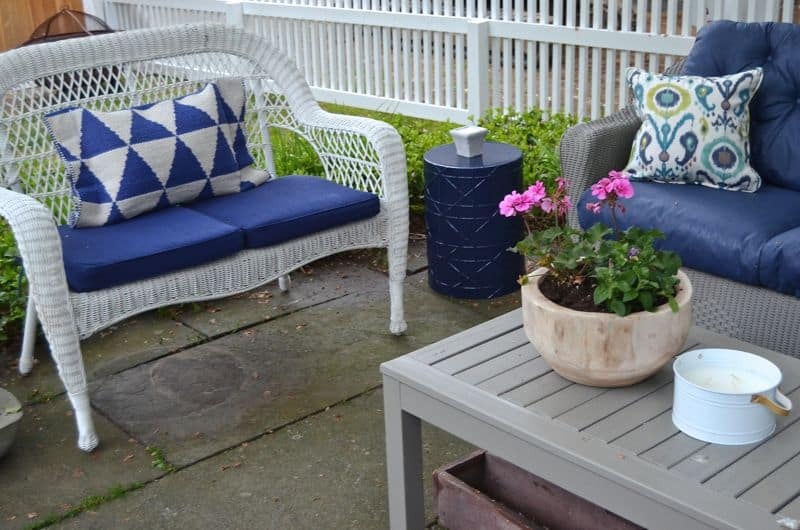 That’s my go to color for outdoor spaces as well! You did a fabulous job of pulling this space together and it looks so cozy! Charlotte I love your back patio and I’m so glad you decided to jump on the challenge after so much business! (Totally hear you there!) 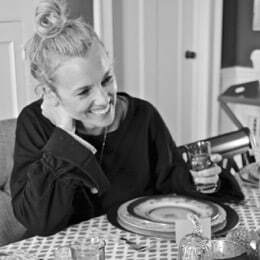 I am hopping in the car right now to rush over to Homegoods and TJMaxx in search of new blue pots and a rug to turn into a pillow. That is so brilliant! Love your style! You did wonders making everything work together! And a big yes to the elephant and the universe. If you figure out the secret to trimming succulents, let me know. 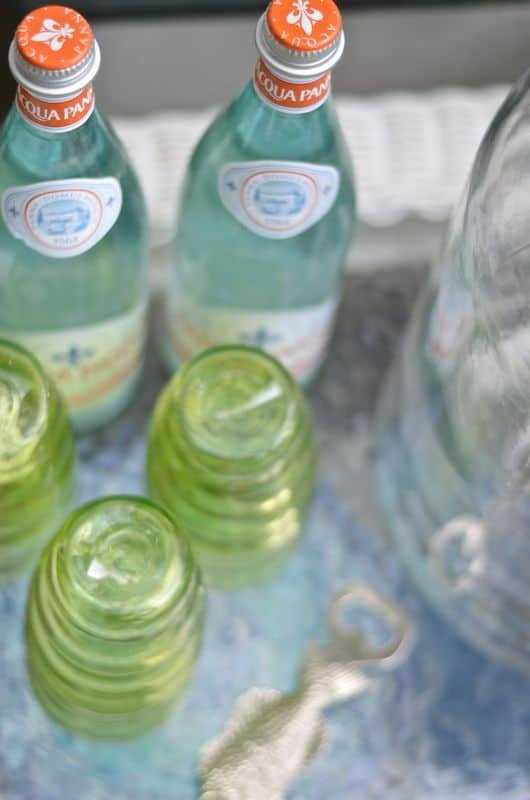 The secret to cleaning them without knocking the little leaves off would be helpful, too! 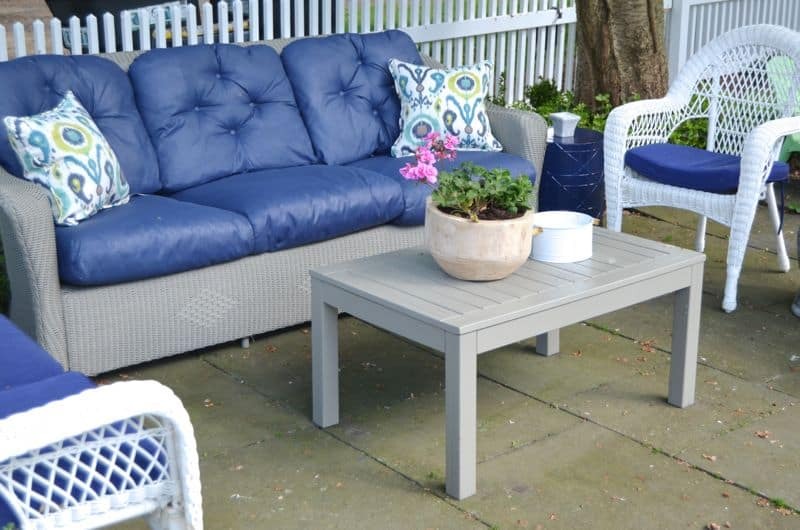 Enjoy your fabulous outdoor space this summer! HA! I’ll keep that in mind. Mine are currently just plain out of control. 🙂 Thanks!! Nice sunny day today so lunch was outside! woohoo! Great makeover and a lovely warm space Charlotte. I had to l look twice to recognize your repainted couch. And I’m glad y ou went with the white wicker. It really brightens up the place. All in all, I would say you did a fantastic job because that is a lot of furniture out there. Oh I have a special place in my heart for your cute elephant. A beautiful transformation (and photography!). I can’t believe those cushions were painted, they look fantastic. Love the mix of furniture and I’m definitely team white whicker. The elephant looks at home! THanks, Kathy! You’re sweet re. 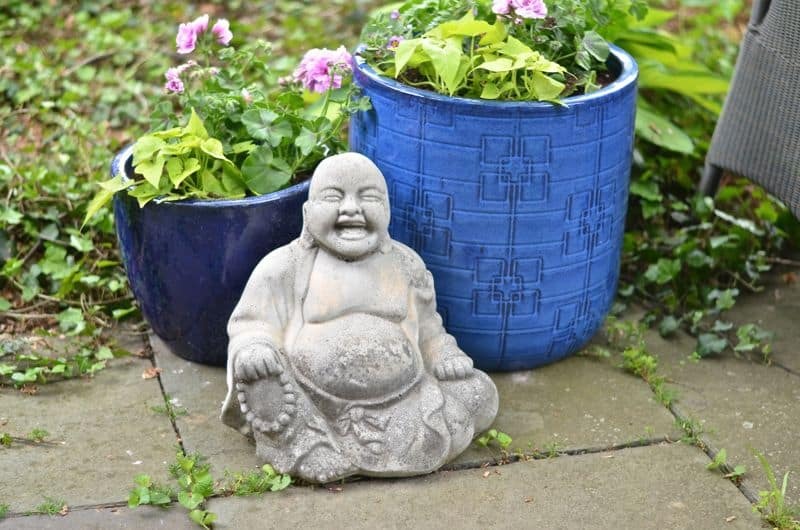 the pics… outdoor spaces are the HARDEST if you ask me! 🙂 A little construction in the background doesn’t hurt… The white was the obvious choice. Funny that I even wondered!